A weekly review of St. Louis fish fries, including the Metro East in Illinois and Saint Louis County. A family of five takes an adventure to a different fish fry each Friday of Lent, including Ash Wednesday and Good Friday, in search of the best fish fry in St. Louis. Friday Night Fish is the only review site site that combines comments on Urban Design, Sustainability, and Fried Cod! Another great year! We made it to Illinois, south county, west county, and St. Charles! We truly take in the whole region when it comes to fish fries! Enjoy our 2013 highlights! The biggest turnout in voting yet! Almost 2,000 votes total in the two rounds of voting and almost 1,400 votes in the final week as Saint Mary Magdalen and St. Ferdinand battled for first place voting during the finals. 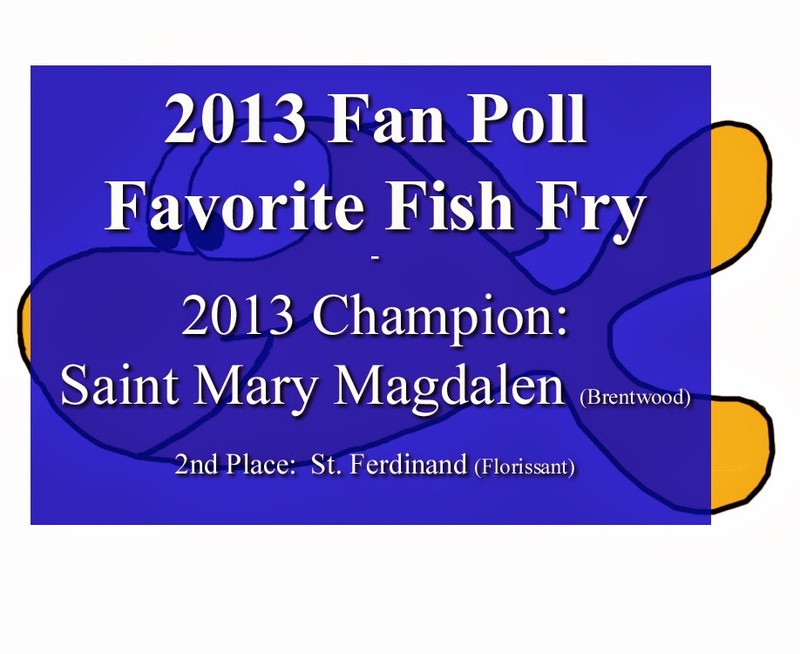 The voting went back and forth until the final hour with Saint Mary Magdalen edging out St. Ferdinand to become the 2013 Fan Favorite Fish Fry. Friday Night Fish was proud to recognize both fish fries with an ad in St. Louis Review newspaper. It was fun to visit Saint Mary Magdalen the week after they won, they had signs up encouraging people to vote in the fan poll. A lot of great Cod this year. Every week was some good Cod. Holy Infant was probally the best Cod, but St. Matthias and Saint Mary Magdalen all had very good Cod. By far the best value was Saints Joachim and Ann. Only $25 for our family of five. Sain Joachim and Ann made the #5 Best Value on our all time list. If you are looking for a quiet, yet refined fish fry, check our Holy Trinity Serbian in south St. Louis. No lines, yet great service and food. Best coffee was Holy Redeemer as they brought in Starbucks for their fish fries. Saints Joachim and Ann had one of the best rituals as they would ring a bell for every new visitor to their fish fry. Although we didn't make it to St. Ferdinand this year, they celebrated their 60th year of fish fries! Congrats to St. Ferdinand! Overall, another great year! As we always say, there are never any bad fish fries. Kudos to all the volunteers who work so hard to make their parish fish fries a success! Sometimes it is hard to compare fish fries from year to year. Comparing that Cod from 2014 to 2008 can be a little tough. With that in mind, below is a yearly re-cap for each of the following years. We got a little busy in 2015, so never finished a year end recap, so sorry! 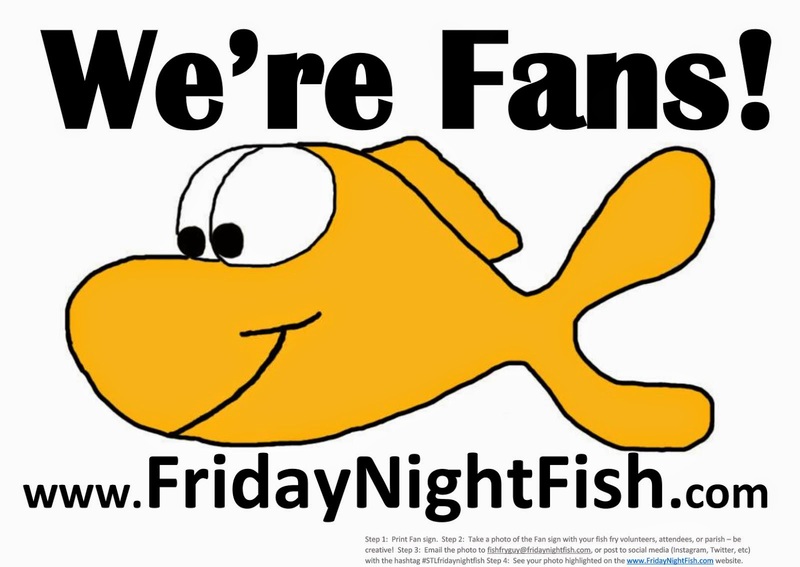 Every year Friday Night Fish hosts a fan poll to crown a yearly fan favorite Fish Fry. It's a two step process with Round 1 selecting five finalists, and Round 2 voting from the final five to crown the yearly fan champion. So get ready every year for the annual poll and get your supporters voting for your favorite fish fry! We had some voting "irregularities" in 2014, so we discontinued the poll (for now). For a recap of past winners see Past Fan Poll Winners. Be Our Fan and Like Us on Facebook! Is the fish fry easy to find? Is ordering clear and easy? Are there logical and helpful signs? Does the line move efficiently? Are real plates, silverware used? Recycling? The most critical element: How does the Cod stack up? Other selections? Side dishes? Kids Menu? How big are the portions? Dessert and drinks included? Is the atmosphere lively? Music? What is the architecture? What kind of seating? We rate each category out of 4 fishes and give an overall ranking. First of all - THERE ARE NO BAD FISH FRIES! Every fish fry is GREAT! These reviews are completely subjective and meant to be fun. Fish fries are great for each parish and each community and are part of the neighborhood fabric that makes St. Louis such a great place to live! If you truly want to experience a sense of place and community, check out one of these fish fries (or any fish fry), you won't be disappointed! 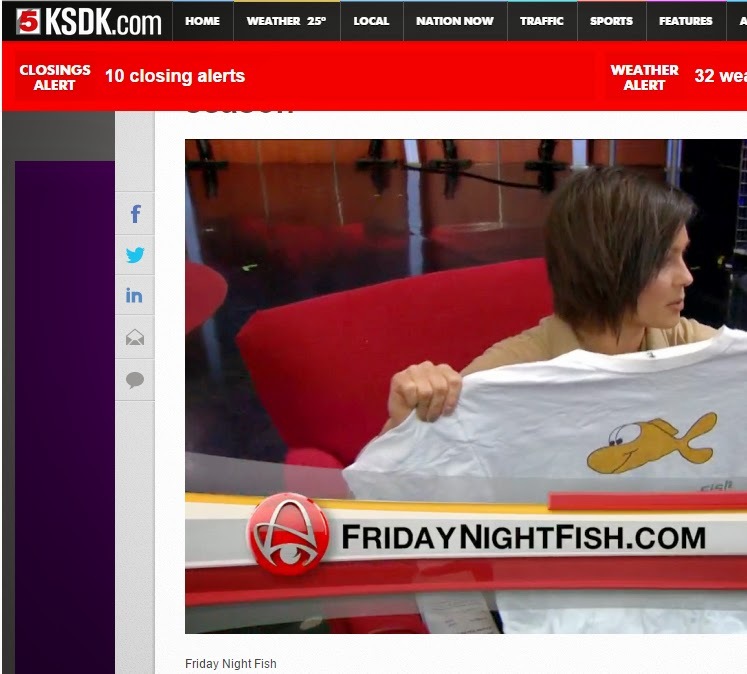 We were excited to be on KSDK's 'Show Me St. Louis' talking about fish fries. Click the 'We're Fans' image above to download a PDF of the 'We're Fans' poster. Take a picture at your fish fry with the poster and share with us at Friday Night Fish! Friday Night Fish is the only review site site that combines comments on Urban Design, Sustainability, and Fried Cod! A few questions from our fans. Q. We invited you to our parish fish fry, when will you attend? We truly appreciate all the emails and suggestions on good fish fries to visit or personal invitations to your parish fish fry. We will get there eventually! We strongly believe in supporting fish fries across the region. Every year, we try to attend at least one fish fry in the City, north county, west county, south county, and Illinois. That takes at least five out of seven fish fries. Plus with a wife in choir, kids activities, friends and family to visit, it can get hard to get your fish fry on our schedule. But keep sending us suggestions. Like I said, we'll get there eventually! Q. Why attend so many fish fries? When you have three kids under the age of 9, it is a good way to spend a Friday evening and feed the whole family for $25. Plus, it is fun to see the sense of community each church has. Every fish fry is a snapshot into the social and demographics of our area. People often say St. Louis is one big small town, there is no better way to celebrate that fact than a local fish fry! Q. How many fish fries do you plan to review? I figure 3 to 4 more good years for fish fry attendance before the age of our kids will make sports, music, and other social commitments limit our time (Or our kids will finally refuse to go). So maybe 20-25 more reviews with a total of about 55-60 reviews. With Ash Wednesday its possible to get 7 reviews each Lent, plus some churches will have fish fries in the "off season". But that is alot of fried cod! Q. Are you available via Facebook and Twitter? We're on Facebook! Thanks to our great technology group! (my wife). Twitter, probably not. Ask yourself, "Do I really need live updates about Fish Fries?" Of course, does there really need to be a website about fish fries? Q. Can I list our parish fish fry on your website? See the links above for Channel 2' fish fry finder and the Google Map listing of fish fries. Those are good sites to list your fish fry. Q. Our parish needs some help with our fish fry. Do you provide fish fry consulting? Q. Your writing prose tends to be terse and fragmented. Plus you tend to say "A good solid fish fry" alot. Are you familiar with Strunk and White? Yes - A good solid reference. I'll utilize. Q. You gave our church a score of 2.5! Why don't you like us? Remember, there are no bad fish fries! It is like you own a Gaugin worth $25 million and your neighbor owns a Monet worth $30 million. You're both millionares and you own a masterpiece. Each fish fry is a masterpiece of community spirit and the hard work of volunteers who toil and sweat each week for a labor of love and a good cause. Q. Can you recommend any good books on St. Louis Fish Fries? No, but I am currently reading David McCullough's 'The Path Between the Seas. The Creation of the Panama Canal'. Highly recommended. Q. Did Ferdinand deLesseps ever go to fish fries? I believe he once motivated his parish volunteers, when they once ran out of fried cod, by saying, "Avec les coeurs et les esprits comme le vôtre, tout est possible (With hearts and minds like yours, everything is possible)."